Not only is turnover up, profit has increased by 84% and we have increased our team from six to eight people . Director Mark Saxby said it had been an amazing year, bolstered by working with companies such as national pet retail chain, Kennelgate, national surveyors Fisher German and Allison Baby, which owns leading nursery brands, Joie, Graco and Nuna. 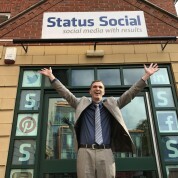 Mark’s wife and fellow director, Kerry, said another breakthrough for Status Social was being able to report on significant sales being generated by our clients – proving our services are worth investing in. 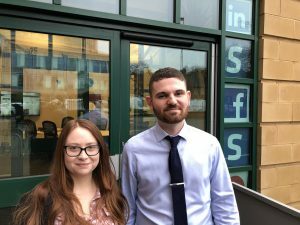 “We’ve had one client tell us they’re generating £18,000 a month thanks to our training, another has made £54,000 in the last six months and a third sold 1200 products when our team created and managed their social media accounts. We’ve also seen more clients asking for help to use social media to recruit and provide customer service. With one of our clients, we’ve so far found them forty candidates, saving them a fortune on recruitment costs. As well as financial success, we also won the Derby Telegraph’s Contribution to the Community award, mainly thanks to our work addressing social media problems in schools. The schools work is due to be launched as a separate charity, Positive Social, in early 2019. Want social media success for your organisation? Join the Status Social success story, from bespoke Social Media Training to Social Media Management, we can help you and your organisation reach your business objectives. Contact us to make 2019 your first year of social media success.